On July 21, 2016, Orion Owens ran from a sandy shoreline and dove into a recreational lake to join 4 other friends for a moonlight swim in Eden, Utah. Still to this day his friends don’t understand what he did differently to immediately sustain a catastrophic spinal cord injury bursting his C6 vertebrae paralyzing him from the chest down and unconscious underwater for nearly 5-7 minutes. He was revived by his friend Marshall, air lifted to the closest trauma center in Utah and one week later flown to Craig Hospital in Denver, CO specializing in spinal cord injuries. A playful night turned tragic for Orion, his family and friends. Prior to the injury, at 22 years young, Orion was on his way to being a self-reliant young adult fulfilling his goals as an upcoming videographer and photographer. He was attending Cal Poly San Luis Obispo while managing a successful business involving international film projects. He was an avid athlete who enjoyed multiple sports and particularly loved the ocean. His friends will tell you that his smile was contagious and he could make friends, in any part of the world, in an instant. Over the past two years Orion received intensive rehab at Craig Hospital and continued out-of-pocket therapy at home in San Diego utilizing donations from previous fundraisers. Orion has improved from the initial onset of the injury. He now has some movement in his left leg and foot, his left hand and fingers continue to improve along with stronger upper core. He works on standing with assistance and support from trainers. Ongoing consistent training is not only important to promote further healing, but also to prevent secondary complications associated with the paralysis of this injury. Orion is striving to rebuild his business and get back to his passions in life: filming, photography and travel. He wants to live independently and provide for himself, but right now he still needs financial assistance. There continues to be many out-of-pocket expenses for therapy, alternative care such as acupuncture, wheelchair repairs,home modifications, adaptive equipment, some caregiving assistance, and many other injury and medical related expenses that his insurance will not pay for. Donations to Help Hope Live in honor of Orion, a 501(c)3 nonprofit, are tax-deductible to the full extent allowed by law and will reduce the financial concern and burden to Orion and his family. This assistance will enable Orion to continue vital rehab and pay for the many medical expenses with less worry while also figuring out how to return to the life he loved. Please consider making a contribution by hitting the GIVE button. Thanks to High Fives Foundation Orion was able to take adaptive ski lessons with STARS while in Steamboat Springs, CO AND funded Orion’s High Fives Winter Ski Camp in Winter Park, CO for 3 more days of ski lessons while spending a week with other High Five athletes. He advanced, impressing his instructors when he returned to Steamboat and made some great runs down the mountain. 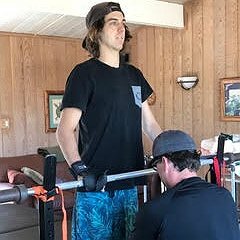 Thanks to donation here at HelpHopeLive so Orion can continue to build his strength and train his body for recovery and more athletic adventures. This past week Orion has been taking Sit-Ski lessons. It is tough! Many falls learning to remain upright with only arm and shoulder strength. Thanks to donations he can continue out-of-pocket therapy helping him to improve and get strong enough to participate in these sports. Orion is getting ready to try adaptive skiing this winter. It is donations like these that have helped him with ongoing therapy to get strong enough to do this. Thanks! Will post update of Orion on the mountain later this month. "Bunco Babes of East County" support your path to healing, and look forward to seeing your artwork! Annie Johnston Micki Plummer Debbie Orly Jean Minter Judy Boyd Sheila Dowe Penny Barnaba Mary Nichols Jill Lehto Claudia Deney Nan O'Gara Kathleen Rivers HELP HOPE LIVE !!!!!!! Believing the best for you Orion! Keeping the Faith and praying for continued healing. I hope you find strength and renewed vision as you move forward. God bless YOU and your family...:). Love your photos....incredible! I am walking for you! Groovey healing vibes, uber visualizations and many prayers lifting you up! We keep Orion Owens in our thoughts and prayers always. Here's to Orion getting back to his passions in life!